On Friday I went to vote in the election and referendum taking place here in the Republic of Ireland. I was utterly disgusted by the conduct of passenger David Mesher recently on a Ryanair flight when he racially abused fellow passenger Delsie Gayle just before a flight from Barcelona for Stansted Airport on October 19th. The ugly incident was filmed by fellow passenger David Lawrence. The footage shows Gayle’s daughter Carol Gayle defending her mother and showed another fellow passenger intervening and saying to Mesher that there was no need for his racial conduct. It is awful to see the abuse that Delsie Gayle has went through. I’m just very glad it was caught on camera because otherwise there would be no proof of the incident and nothing would probably be done. I think it’s a disgrace that he was left on the flight. He should have been removed. It is terrible that this discrimination and abuse is still going on and Mesher’s apology is pretty pathetic. When losing your temper, race doesn’t even come into it unless you are racist and he was extremely aggressive too. It is the easiest thing in the world to say you aren’t racist after displaying racist conduct. If you truly aren’t racist, or at the very least certain things in your make-up aren’t or currently aren’t from a racist place, you wouldn’t act in a racist way. I find it very heartbreaking hearing the pain this incident has caused to Delsie Gayle and it is important to remember that our words can hurt people. Is that the kind of people we are? Do we really want to go out of our way to hurt other people? Harris said he would be reviewing the situation on Monday with management. The Minister of State with special responsibility for disabilities, Minister Finian McGrath will also be attending the review. Bray Emmett’s GAA club has offered its clubhouse as a temporary home for Lakers and another source lent a wheelchair accessible bus. Founded in 1989, Bray Lakers is a social centre where people, both children and adults, with intellectual disabilities have the opportunity to participate in a wide variety of social activities such as art, music and sport. There is 400 members and 150 volunteers and staff. I live not far away from the Bray Lakers building and it was very sad and shocking to hear about the fire. The main thing is that thankfully no was hurt. The organisation does fantastic work and is a credit to the Bray area. A GoFundMe page has been set up to help raise funds for repairs to the damaged caused during the fire. Buster From Down Wins The Nose of Tralee 2014! Pet Sitters Ireland held the most fabulous competition The Nose of Tralee for animals around Ireland! Yesterday I blogged about The Rose of Tralee and now I’m blogging to you all about the animal version. As an animal lover my heart was bound to be stolen a million times over! Towie’s Harry Derbidge Speaks Out About Anorexia! Recently I read about The Only Way Is Essex star Harry Derbidge talk about his struggles in his battle with anorexia. It didn’t surprise me because I went through a mild version of anorexia myself and when you do you tend to see the possible signs even though you are only reading about a person in the press. I think he is incredibly brave to talk about it, especially been so young. It’s a major issue to put yourself out there and talk about after all. He says that he realised at 14 that he “had a problem with food.” and says that his mother Karen sent him to a doctor because she was so worried. There the doctor weighed Harry. His weight was 7 and a half stone. “An average boy should be around 10-12st and I’m 5ft 10in. My chest was just bone.”, Harry said. He told how he went to a doctor a year and a half ago who weighed him and told him that he was near anorexia. The doctor told him that if he didn’t do something about it he would end up in a clinic. Three days ago two fires broke out in Bray. One of the fires was in Castle Street and my sister heard the bang from the fire which broke out on Castle Street when the fire broke out around 4:40pm. She was scared that I was near it because I had been finishing off some writing and said I’d catch up with her. Thankfully I wasn’t. The fire broke out at Everest Cycles and destroyed the shop along with neighbouring businesses which included a hairdressers, a Polish supermarket, a health food store and a clothes shop that my mum was in the day before. 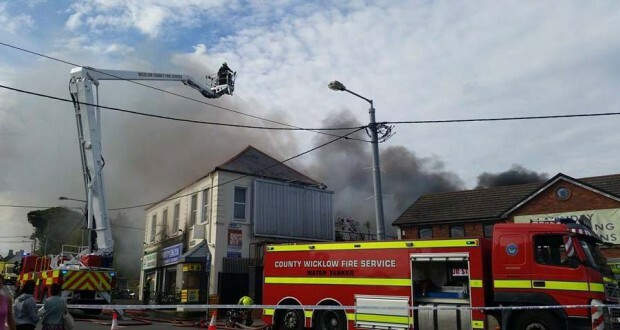 A spokesperson for the Wicklow Fire Service told how four units of the Bray Fire Brigade arrived at the scene, including a water tanker from the Greystones Fire Brigade. 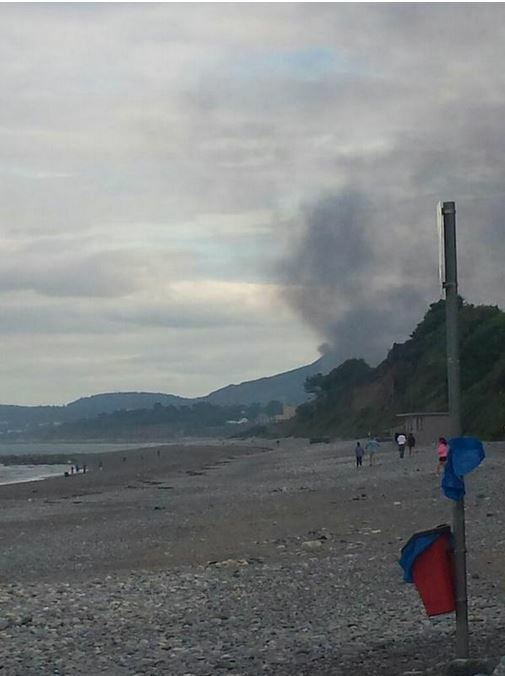 A gorse fire also in Bray occurred on the same day. There was smoke all over the town and members of the gardai were directing us on the roads. I’m just glad there was no one hurt and I hope that the businesses can get themselves back on track but I know that isn’t going to be an easy task. 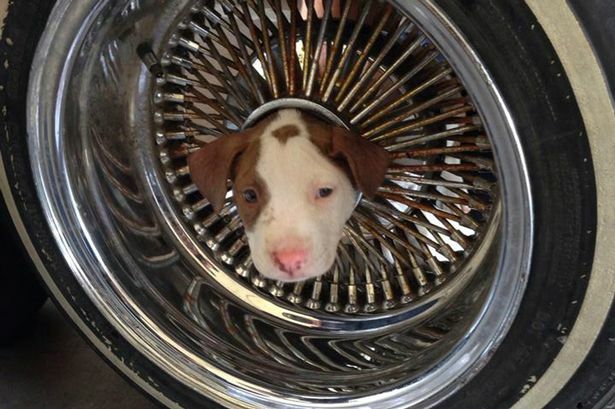 A curious puppy in California got his head stuck in a car tyre and the sweet little pup’s owners brought their puppy Junior to their local fire station to be freed. 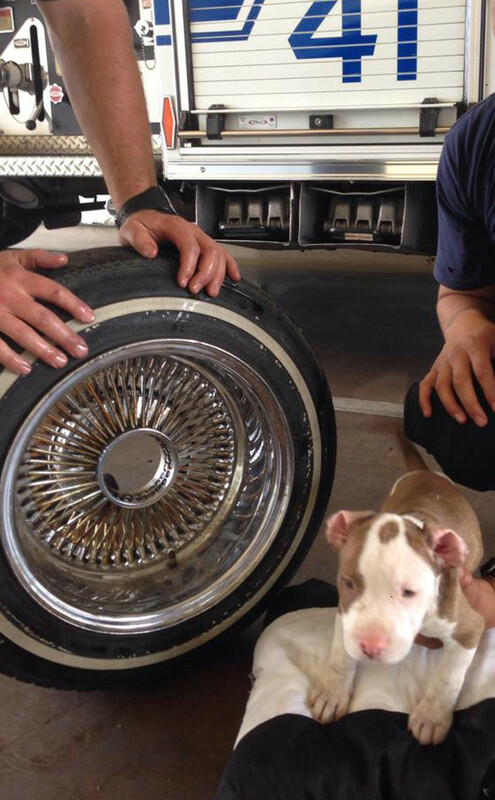 Firefighters from Station 41 in East Bakersfield used “cooking oil and a little ingenuity” to ease the pup to freedom, then posted pics before and after on their department’s Facebook page. A spokesman for the Kern County Fire Department said the rescue only took around 10 minutes. 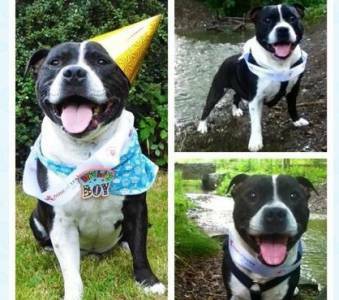 The puppy had been playing on a patio with his seven siblings where his owner’s tyres were, the puppy’s owner said on Facebook. She said that Junior was fine after the incident and is well.